Imprevist Resto and Wine – A Cozy Creative Experience you Shouldn’t Dare to Miss! Let’s face it! Food is a big part of vacation. Many of us diet strong weeks before taking the flight, just so we can arrive with freedom to ignore calorie counting for several days in a row. With that being said, if you are going to give yourself some extra freedom, you mines well use it on, not just any meal, but something truly fantastic! 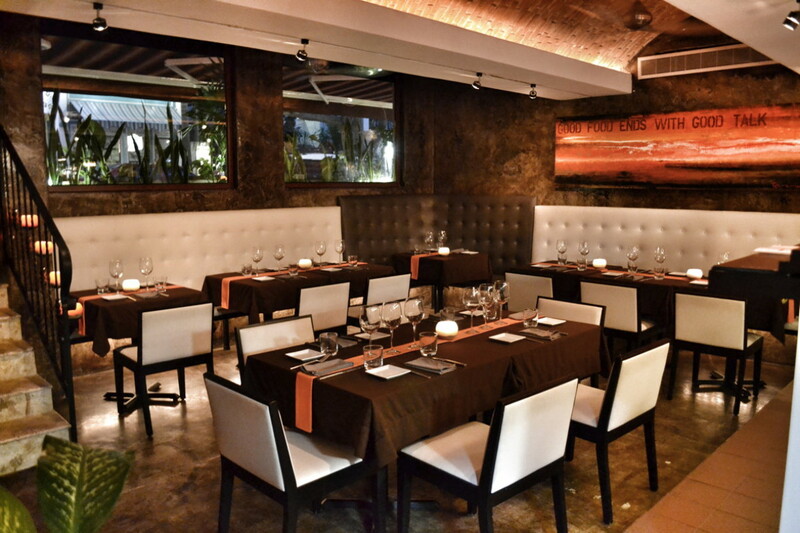 If you are looking for a great spot to enjoy during your vacation I would like to share with you one of the most special little gems in Playa – Imprevist Resto and Wine! Located on a quaint and quiet street, IMPREVIST invites you to enjoy a real culinary experience that will surely leave you with special feeling. Imprevist is a Catalan word meaning “Unexpected”! And here you will truly see how the name fits with its true meaning! There’s something to be said about Small and Cozy! Their cozy intimate dining room is inviting! The service is warm and attentive! And the food is simply delicious and memorable! What I love most about this restaurant is that you really feel good while you are there. Whether you are having date night with your honey, enjoying an evening with friends or having a classic family dinner – Imprevist is a place that accommodates a particular at home feel that many can only find in the coziness of their own homes. Their dinner menu features classic International cuisine with Chef Juan Diego’s special flare as well as an alternative Asian Fusion menu that will truly give you a twist on the ordinary. My absolute favorites are the chicken risotto, salmon with mango sauce and the chicken Thai Salad (also served with shrimp at your preference). Steak lovers and seafood lovers you are also in for a real treat! And for tuna lovers, let me offer a piece of advice that you will be glad you took – you must experience their famous Tuna Tar Tar which had been a true and unchanged staple on their amazing menu! Let’s talk Risotto, shall we? By far the best Risotto I have experienced, not only here in Playa, but anywhere for that matter. Chef Juan Diego has mastered the art of Risotto with sheer grace! The menu features a choice of risottos blending different flavors and using a variety of different meats and seafood to top it off. The Chef behind all the Magic! Over the last year I have gotten to get to know Chef Juan Diego Solombrino and have become really interested to understand his style. I can tell you is that Chef Juan Diego puts a lot of love and pride into his kitchen and puts a lot of care in what he brings to the dinner table! He loves to play with different flavors and aromas which is why you will likely notice seasonal changes in his menus allowing him to take advantage of the seasons freshest ingredients, flavors and colors. The Best Sunday Style Brunch in the Region! Really, who doesn’t love a good brunch! Imprevist puts on a great breakfast and bunch social every day! Perfect for early or late risers. The breakfast menu always includes fresh fruit, yogurt and granola, a basket of freshly baked pastries, fresh juice and coffee! For me, this is hands down the best breakfast experience in Playa del Carmen! You can find Imprevist locate on 1st Avenue between 16th and 12th street! If you visit Imprevist you will most likely be greeted at some point by Christine, Juan Luis or Chef Juan Diego as they are always there to personally insure the best experience for all of their guests. Imprevist opens for breakfast every day from 7 am to 2 pm. Dinner is served Monday thru Saturday from 6 pm to 11 pm. I should also mention that the owners of Imprevist, Juan Diego Solombrino along with Juan Luis Wehncke, have also partnered up to create a secondary amazing experience just down the road from Imprevist, called PLANK! If you have the chance to try both during your trip you will definitely be in for a real treat!